2007 Horse Journal Top Choice! No Sugar! No Fillers! Voted top choice in the March 2007 Horse Journal, Perfect Balance Electrolite provides rapid re-hydration by including proper levels of sodium, potassium, chloride, sulfate, magnesium, calcium and chelated minerals in a highly concentrated and highly effective formula designed to match the proportion of electrolytes lost in your horse's sweat. 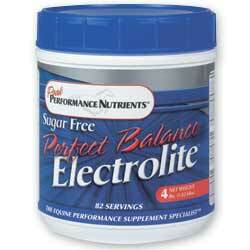 Perfect Balance Electrolite helps ensure proper electrolyte absorption and balance. In a buffered formual! No added sugar or other fillers!